Over the years, I’ve done a few posts on unschooling. I did a Day in the Life (that’s a few years old), How Unschoolers Learn to Read, and Unschooling as Kids Get Older. I’ve found that people really want to know more…especially as kids get older. 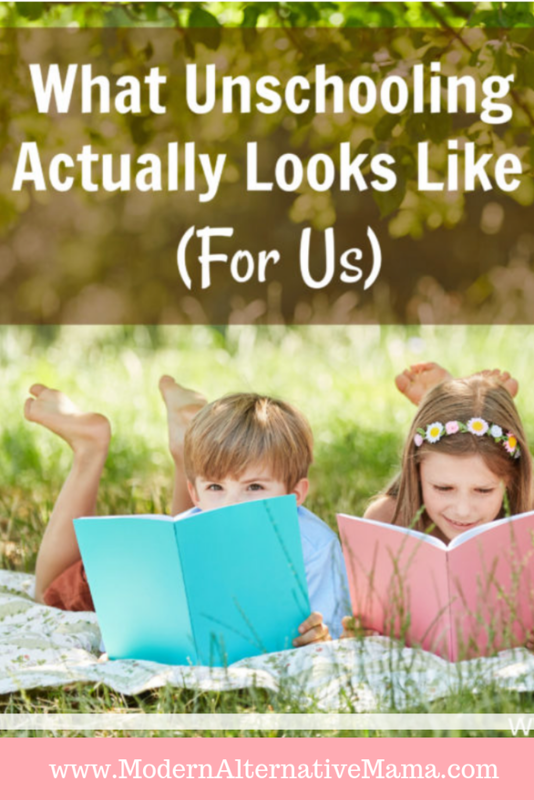 Things have changed a lot for us in the past couple years, as we went from having mostly younger kids and non-readers, to having some older kids with half of them reading. We’ve found our stride, as unschoolers…so I wanted to show all of you exactly what that looks like. This isn’t to say, at all, that this is the only way for unschooling to look…or the best way. This is what has worked for us, and we’re open to changing it if it ever doesn’t fit for us. Right now, it’s working. I know that a lot of people who are curious about unschooling need some concrete examples, because all the ethereal “trust the child, follow their lead, let them do what they choose!” is hard to swallow. It seems like kids, if given the choice, would just play all day and not do anything meaningful or ever learn anything. That has not been our experience. At all. Rather than giving a daily run down, I’ll give an overview of what we “do” over time — what structure we have evolved, and how. On a fairly regular basis — every week or so — I talk to my kids and ask them how they’re doing, what they’d like to learn, if they need any help or support, etc. We make goals together, talk about the future, and generally just spend time together. They let me know if there’s anything they need from me — new materials, for me to sit with them and answer questions, etc. Of course, they come to me at random times and just tell me what they need or want, too. Random conversations often turn into learning opportunities. My 9-year-old came into tell me he was “being a jumping bean,” and I asked if he’d heard of Mexican jumping beans and knew what they were. He didn’t, so we found a video that explained it. We have a lot of moments like these, and I try to seize opportunities as often as I can. Each of the kids (ages 5+) has a 1″ binder. In this binder are sections for math, language arts, puzzles, and science. They request what they want put in the binders, and I add it. These can be math worksheets (they do a mix of addition, subtraction, multiplication, division, fractions, decimals, and a few other things), sudoku, word searches, crossword puzzles, mad libs, etc. We pull from a bunch of different websites as needed. Since the kids all learned to read, they’ve gotten really into the library. We go once a month for a homeschool gathering/event and they spend an hour meeting new friends and doing little activities. Then, we pick out new books. If they need more books in between, I reserve them online and pick them up. Each of the older kids is reading around 6 – 8 books per month at this point. Their favorites are Diary of a Wimpy Kid, Dork Diaries, Creeper Diaries, and Captain Underpants. They are allowed to read whatever they want to. We suggest books to them, and we have offered them Harry Potter, The Chronicles of Narnia, and other classics we loved as kids. But it’s fully up to them what they want to read. Some of them also choose to read non-fiction. My daughter especially likes to pick up books on nature — books on identifying plants, facts about countries or bodies of water, stuff like that. She also enjoys cookbooks and reading about different cooking techniques. We also do a variety of “projects.” The kids choose to cook a lot, and know how to make several meals. (They do muffins and quick breads, yeast breads, eggs, burgers, pancakes, salads and dressings, grilled and fried meats, etc.) The boys also have books on computer coding, and have been learning to program. We have art supplies available, and they will work on creating various things, depending on what strikes their moods. They often incorporate nature items into their creations, and look to solve problems around the house or yard. We also occasionally do classes or lessons around the city, if the kids have an interest. The boys have requested to do a creative writing class monthly. We do watch TV. Sometimes, it’s kids’ shows, like Wild Kratts. (They’ve learned a lot about animals from it — they tell me things I don’t know!) Sometimes it’s TedEd — they really enjoy the history and puzzles videos. And sometimes it’s just whatever cartoons they feel like watching. The kids also really like to use phones or computers to text with us. My daughter has the Messenger Kids app, and she has a few family members and a friend that she texts regularly. She’s learned how to spell a lot of words from doing this. The kids also like to sit with me while we write each other messages on my computer. It started off with silly sentences so they could learn to spell and use punctuation, and now we write each other poems in different styles. Haiku and acrostic were what we did recently, and the boys enjoyed writing their haikus a lot. What Do They Actually Learn? It sounds like a lot of play time, right? Play is learning. Sitting down with worksheets is a tiny part of our day, because while that looks like “work,” it often doesn’t lead to meaningful gains in knowledge. Many students spend a lot of time doing busy work, but that doesn’t mean they really are learning. So far, they’ve learned to do basic math (four functions, plus decimals, fractions, order of operations, measuring, basic geometry), read (they would all now be considered at/above “grade level”), lots of science (especially earth science), history (American history, ancient Greek history), writing (they’re learning to spell more complex words, and learning forms of poetry). I’m not sure I can even quantify all the things they know, since they don’t take tests or have grades (not that those actually prove anything, anyway). I just notice when they share ideas with me casually that they know more things! Unschooling is not for the lazy. The parent actually has to be heavily involved…just not in a commanding role. My job is to constantly expose the kids to new ideas. I challenge them to try new things, and offer them new options. For example, it was my idea to sit down and say “Hey, want to learn about these styles of poetry?” If they’d said no…we wouldn’t have. But since I don’t push things on them, they are generally pretty curious, so they said yes. They enjoyed it so much that they often asked in the subsequent days if they could write poetry with me again! I spend time researching ideas, and I purposely start conversations about different topics with them to see what they latch on to. I offer them local classes. I show them books to see what they want to read, and encourage them to give the books a try (but they don’t have to finish them if they don’t like them). Basically, I “invite them in” to new things. It’s true that unschooling can be done badly. If parents are expecting their kids to just know that ideas and information are out there with no assistance at all, no exposure to those ideas, well, that’s not going to work. Parents need to fulfill the role of mentor — they work with the kids. Plus, since many kids are not developmentally ready for certain skills, or not interested (and there’s a wide range of abilities in a single classroom), there’s a ton of silly, fluffy activities to try to help kids grasp concepts. For example, a letter B scavenger hunt, coloring in the letter B, tracing the letter B…. With unschooling, things don’t work that way. Kids learn skills when they see a need for them…and they learn them fast. It’s often as easy as saying “that’s the letter B.” If they’re ready, they say okay, and they don’t forget it. They often go in spurts. Some particular skill or bit of information interests them; so they’ll expend a lot of time and effort to work on that one thing. They may focus on it for several hours a day for days or weeks at a time. They may make huge gains, amount to multiple years’ worth of public school curriculum, in a few short weeks. One of the best “side effects” of unschooling has been that they don’t have the same expectations or connotations that children in school do. They don’t care if they are “ahead” or “behind” in a subject; they trust themselves to get there when they’re ready. Sometimes they ask me to grade their work, but whether they get an A or a D, they don’t actually care. There’s no stigma attached to any of this. A “D” to them would mean they just need to work harder at that skill, or take more time with it. Sometimes, they approach learning a topic in a totally random way, and go from seeming to not understand it, to being totally competent. He wouldn’t have even been in kindergarten yet, so we just set it aside. Then, in the late spring/early summer, he started asking me math questions constantly. “What’s 1+ 1? What’s 5 + 7? What’s 100 + 100?” It went on for weeks, and he asked me increasingly complex problems, sometimes getting very silly with it (“what’s 1000 + 1000 + 200 + 7 + googleplex?”). Then he stopped. This fall, he asked for math sheets again. I printed him a couple that had pictures to count, and a couple that didn’t. He sat down, and wrote all the right answers in without needing any help, and without needing the pictures to count. He asked me for the information he needed, processed it in his own way, and figured it out — with really no help from me, other than my being willing to answer him. Are they REALLY Motivated to Learn? Sometimes my daughter announces “Let’s do school!” and gets out her binder, and sets goals for herself — and often talks her brothers into it, too. In general, they want to know things about the world. When they see new information or skills that will help them do more things, they want to achieve that. Yes, in the first few years, it seemed like they were kind of “behind” in some areas, and some people looked at public schooled kids and thought that I was screwing it all up and neglecting their education — and occasionally, I had my doubts, too. But then, it all started going in fast-forward. They picked up skill after skill so quickly. They jumped “grade levels” in ability in a matter of weeks. This began around age 7 – 8. That’s when I knew we were on the right track. And now? The kids come in and tell me how much they like learning, and like that I teach them things. They’re happy, they’re learning, and that’s what matters. What does unschooling look like for you? What questions do you have? Thank you so much for sharing! My son is young, so I still have lots of time to convince Hubby to let me homeschool (or unschool!) but one of my biggest questions about unschooling is this… what if your child wanted to go to college? I just don’t want a decision that I make to take away opportunities for my child as an adult. Unschooled kids go to college too! If they decide that’s the path they want to follow, then they spend some time preparing for it in their teen years — choosing curriculum to prepare for college courses, even taking college courses under post-secondary programs (our state allows any child in 7th – 12th grade to attend a public university for FREE for a certain number of hours each semester). They would learn to take the SAT or ACT. Basically…when they decide they want to do it, they do. Unschooling absolutely does not take away from that. At this rate, your kids are going to be qualify to work McDonalds. I knew someone would have to be exactly as stupid as you are, and I was waiting for it. Thanks for giving me the opportunity, troll. My daughter was reading a “kindergarten level” book TWO YEARS AGO, and oh, wait! She was reading it to her PRESCHOOL AGED brothers! Maybe that’s why…. Oh, but you don’t care about facts, you only care about slandering me and trying to make me look bad. Did you miss the part where I said my kids all read “at/above grade level” now? Or is your own reading comprehension really that poor? Or is it your attention span that’s bad? There’s got to be some reason you can’t understand basic information. Thanks, but I’m sure my kids will some day be your boss — if they don’t fire you for being utterly incompetent! Go troll somewhere else, loser. 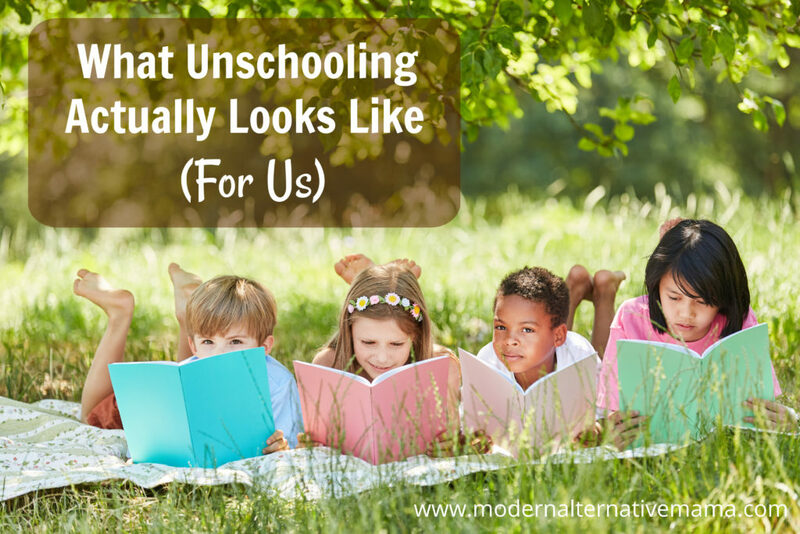 We are homeschoolers, just st the beginning and I love reading about unschooling. We are just at the beginning, my oldest is 5. It’s definitly not for the two of us- we’re both very type A and thrive on schedules, books and lists. Yup she’s 5 and already writing lists. Lol! Now my little guy- he’s only 1 but he is so so opposite of his sister I wonder if I should just unschool him until he asks to not? My daughter loved to sit, color, read… all at one year. My little guy loves “ball balls” cars and tools. Always running and destroying things. I’ll be watching for inspiration, because I think baby two will be challenging my teaching style. I think you may misunderstand a bit what unschooling means. 🙂 Unschooling means that education is child-led. So if your daughter freely chooses to make lists and follow curriculum, that is still unschooling! Because she wants to do it, rather than you telling her what she “has” to do. If your son follows his own path and is more hands-on or uninterested in academics, until *he* chooses to dive in to curriculum at an older age, that’s still unschooling too! A lot of people who are new to it make that mistake — thinking that unschooled kids don’t use curriculum or don’t “study” but they absolutely do! Thanks for writing about unschooling. This is my third year trying to unschool and I still have a lot of questions and figuring stuff out. Lately I’ve been wondering when is the right time to actually seek more support or help for a child who is getting further and further behind? I know trusting the child to learn what they need when they are ready for it is a big part of unschooling. But I highly suspect my kids have learning disabilities and I’m starting to wonder if maybe just doing all the exposing them to stuff and supporting them is enough. Any advice? If you truly suspect your children have learning disabilities, it can’t hurt to get them evaluated and see what support is available to them. I would include them in the discussion about what is happening, so that whatever support they receive is helpful to them and their individual needs and learning styles. (If they hate it and don’t want to do it, it won’t help them a whole lot.) And of course, keep it free from shame — “everyone learns differently, and this may help you.” It’s okay to work with your child and reach out for different methods and ideas that make learning easier for him or her. Hi I definitely want to learn more about unschooling, but I am curious about a few things. How does all this work with the state? As far as reporting “grades” or just what they have learned? Is it different in every state? I guess I’m seriously naive in this. My 2 oldest are in public school and the oldest of those LOVES it. The youngest of those wants to be “homeschooled” and I’m seriously looking into it. Do you have any clue (I guess it’s based on state) if they can continue to play sports for those schools? My 3rd goes to a private preschool about 2 times a week. I do work and love my job, but I only work 2-3 days a week and usually spend my off days cleaning or working on past due projects of my own. Hope I made sense in all this. I can confuse my self sometimes!! Interesting. We are considered “afterschoolers” in my area because we don’t full time homeschool (both of my boys attend a school for many reasons), and we are not unschoolers – but neither are we necessarily “workbook” people. If I were pushed to pick a label, we are Montessori inspired at the younger ages and Classically inspired at older ages. I realize that you might not be purchasing currciulum, but we have recently discovered Michael Clay Thompson (ELA) and Beast Academy (math). I don’t have any affiliation with either, except for purchasing and using their materials. Both are truly inspiring and draw kids in through interesting and unique problems. Until a book by MCT changed my mind, we also started out letting eldest read whatever he wanted, but have now changed that practice. Too often,we adults tend to feel that as long as a child is reading something, then that’s good for them. But a steady diet of Captain Underpants strikes me as similar to a steady diet of eating ice cream for mealtime. It may be ok once in a while, but certainly not as the bulk of a child’s reading “diet”. Please keep encouraging age appropriate, great books (like Narnia or Alice in Wonderland), so that they discover the beauty and deep thought required of timeless writing. Changing my son’s reading material has really begun to deepen the way he thinks and how he thinks about the world. It’s also made an amazing difference in his story telling and creative writing. Also, to Jenn: careful watching may be all that’s needed, but it may not hurt to have an evaluation if you can. Both of my boys have special needs (they are also both 2E) and the evaluations have proven to be helpful and informative. My eldest had an eval for speech at a young age. We decided to wait & watch for 6 months and he ended up making huge gains and not needing therapy. Later, I had him evaluated for occupational therapy, and 6 months of therapy produced excellent results. My youngest, by contrast, has re evaluations about twice a year to assess his gains. He currently receives therapy in several areas, and the therapists have been amazing resources and very supportive. Wow, Kate, what an interesting and comprehensive article. I had never heard of “unschooling”, but this article has piqued my curiosity. I love the idea that real world experiences motivate kids to learn. My nephew is gifted & talented and he is often bored in his classes at school. He really isn’t motivated if his school work isn’t relevant to him. Maybe unschooling is the right alternative. Thank you for sharing your day. I love seeing how learning happens in different houses. The light exhibition is just define. My boys would love it. The post felt very real, especially about sharing your struggles.